Traderush is a binary options broker that opened its doors in 2011 and is regulated by CySEC. Traderush was the first binary option broker that introduced a 60 seconds binary options trade, a feature that has since been introduced by many other binary option brokers as well. Traders that deposit for the first time at Traderush receive a welcome bonus of up to 75%, depending on the type of account that is opened and the height of the first deposit. The minimum deposit is $200. Traderush offers a wide range of tradeable assets. A lot of international stocks and indices, the latter very suitable to take a de facto position on the economy of an entire country. Trading in 8 different commodities is also offered - amongh them oil, gold, sugar and coffee - as well as a good number of currency pairs, including the majors. Trading at TradeRush is web based, so it does not matter whether you are using Apple or Windows yourself. Traderush also offers a free trading app for iPhone and and Android, enabling you to trade live on the go. Another nice feature of Traderush is the sizable trading video library that is available free of charge. New traders also receive a free e-book explaining the ins and outs of binary option trading and how best to use the Traderush platform. Traderush offers new traders a welcome bonus of up to 75%, depending on the type of account you open, which in turn depends on the height of your first deposit. A deposit between $200 and $1,000 gives a directly usable bonus of 35%. A deposit between $1,000 and $5,000 gives the option of claiming a directly usable bonus of 50%. Although the bonus is instantly usable for trading, it can only be cashed after a certain amount of trading. For every $1 in bonus you have to trade a $30 position in binary options before it can be cashed out. That is pretty reasonable compared to the requirements at many other binary options brokers, which on average are around 40x. If you cash out your own deposit before freeing the bonus the bonus will be withdrawn, which is also in line with normal bonus terms. The binary options trading platform of Traderush is web based and offers several features. A free trading app is also available for iPhone and Android. High/Low (Call/Put at Traderush), where you have to predict whether the price of a particular asset will be higher or lower when the option expires. One Touch Platform, where you have to predict whether or not a binary option will have hit a price target at some point before the expiration of the option. The payout can go up to a hefty 500%, depending on how ambitious the price target is. 60 Seconds, where the expiration time of the option is only 60 seconds away. 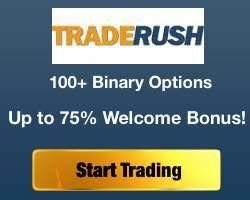 Traderush was the first to introduce this ultra-short runtime for binary option positions. Aside from these features, Traderush also offers the Rollover and the Double Up, enabling you to, respectively, push back the expiration time or double up on your position when the trade seems to be going your way. The Rollover is available until 10 minutes before the expiration time but can only be used once per position (so you can’t keep on rolling over the position until you’re in the money) Traderush does not offer a demo account and is a real disadvantage. There is a video explaining how the platform works but that is still not the same as being able to just take the platform for a spin or just trying out some strategies without having to open real money positions. The minimum deposit at Traderush is $200. Deposits can be done using a credit card, moneybookers, neteller or via bankwire. One withdrawal per month is free of charge, subsequent ones cost $30 per withdrawal, due to transaction costs incurred by Traderush with every withdrawal. Traderush customer service is available 25/7 through chat, email and phone. Traderush is in operation since 2011 and is regulated by the Cyprus Securities and Exchange Commission (CySec). Traderush is an innovative broker, apparent from its introduction of the 60 second binary option - which was subsequently copied by many other brokers - and the speed with which it introduced a trading app for iPhone and Android. The welcome bonus is better than average, as are the trading requirements to free up the bonus for withdrawal. 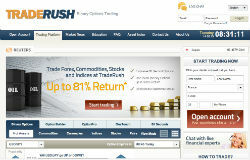 We did find it unfortunate that Traderush does not offer a demo version of its trading platform. The video adequately shows how the platform works, but that’s still not the same as being able to test a platform yourself or use it for finetuning new strategies. The Traderush platform is very userfriendly though, so it won’t take long before you’ll be trading indices, stocks, currency pairs and commodities as if you’ve never done anything else.